Semi-sheer blue and turquoise shimmer. 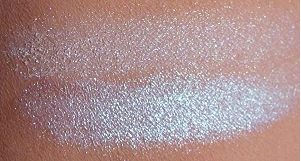 Looks very pale in the jar, but once applied can give a ethereal aqua-blue glow, especially when applied wet. Try a little over pink lipgloss or applying over a black base (shadow, cream liner, etc) for a great effect. For more of our "Ghost" Shades, see Crimson Ghost, Jade Ghost, and Sakura. Swatch applied over bare skin, then over regular primer.